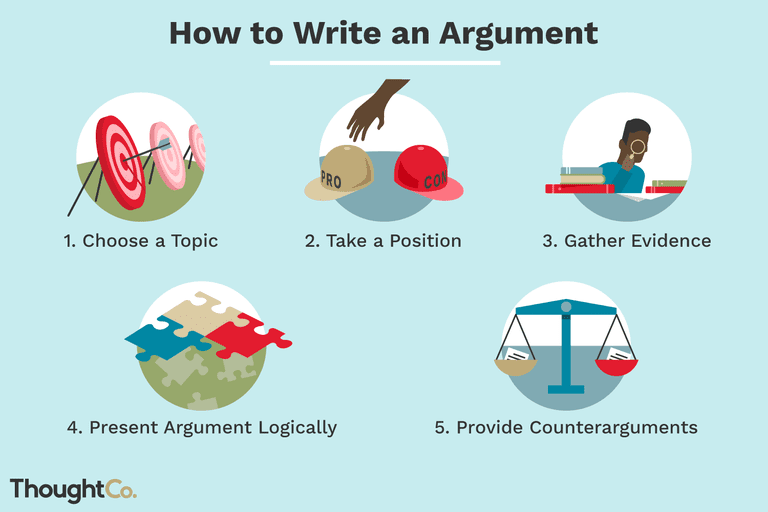 To find a good topic for an argumentative essay, consider several issues and choose a few that spark at least two solid, conflicting points of view. As you look over a list of topics, find one that really piques your interest, as you'll be more successful if you're passionate about your topic. Once you have selected a topic you feel strongly about, make a list of points for both sides of the argument. When shaping an argument you'll have to explain why your belief is reasonable and logical, so list points you can use as evidence for or against an issue. Ultimately, determine your side of the argument and make sure you can back up your point of view with reasoning and evidence. Work against the opposing point of view and prove why your stance is correct. One of your essay's first objectives will be to assess both sides of your issue. Consider strong arguments for both your side, as well as the "other" side—in order to shoot their statements down. Provide evidence without drama; sticking to the facts and clear examples that support your stance. You may look for research that provides statistics on your topic that support your reasoning, as well as examples of how your topic impacts people, animals, or even the Earth. Interviewing experts on your topic can also help you structure a compelling argument. Once you've given yourself a solid foundation of information, begin to craft your essay. An argument essay, as with all essays, should contain three parts: the introduction, the body, and the conclusion. The length of paragraphs in these parts will vary depending on the length of your essay assignment. As in any essay, the first paragraph of your argument essay should introduce the topic with a brief explanation of your topic, some background information, and a thesis statement. In this case, your thesis is a statement of your position on a specific controversial topic. The body of your essay should contain the meat of your argument. Go into more detail about the two sides of your topic and state the strongest points of the counter-side of your issue. After describing the "other" side, present your own viewpoint and then provide evidence to show why your position is the correct one. Work to discredit the other side using some of the information you discovered in your research. Choose your strongest evidence and present your points one by one. Use a mix of evidence, from statistics to other studies and anecdotal stories. A strong conclusion can help summarize your point of view and reinforce with your reader why your stance is the best option. You might consider reserving one overwhelmingly shocking statistic for the conclusion, one that leaves no room for doubt in your reader's mind. At the very least, use this final paragraph or two as an opportunity to restate your position as the most sensible one. When writing your essay, consider these tips to help craft the most rational and poignant argument for your readers. Avoid emotional language that can sound irrational. Know the difference between a logical conclusion and an emotional point of view. Don't fabricate evidence and don't use​ ​untrustworthy sources for evidence, and be sure to cite your sources.